One of the most difficult choices that a man or woman with hair loss will face is which treatment option is best for them. However, sometimes the cost can limit their options and make it difficult to choose the one that would truly be to their greatest benefit. Propecia is one of the lower-cost hair loss treatments, but that doesn’t mean that it’s cheap. However, there are ways you can save on the monthly costs. In this post, I’ll introduce Propecia (generically known as finasteride) and how it works. This will include a look at research studies on the drug, and its potential for side effects. Finally, I’ll break down the costs of a Propecia prescription and the steps you can take to make it more affordable. 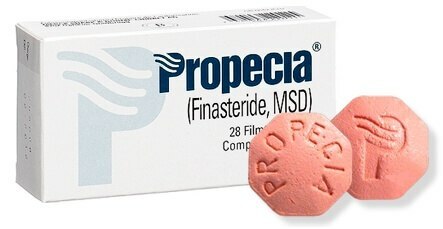 Propecia, also known by its generic name of finasteride, is an oral tablet that was initially developed for the treatment of Benign Prostatic Hyperplasia (BPH) (1). However, clinical trials of the drug soon revealed an interesting side effect: hair growth. Due to the positive effects of the drug on treating hair loss, it was soon being prescribed by doctors for off-brand use. And eventually, the drug received its own FDA approval to be used in the treatment of Androgenetic Alopecia (AGA) (2). The drug works as an antagonist of type II 5 alpha reductase. 5-alpha-reductase is an enzyme involved in the conversion of testosterone to dihydrotestosterone (DHT). Propecia works by reducing the activities of 5AR and, as a result, reducing the levels of DHT within the body. In fact, the drug has been shown to reduce scalp DHT by 64% and serum DHT by 68% (3). Men and women with AGA are sensitive to the aforementioned androgen hormone DHT (4). More specifically, these individuals have hair follicles which react negatively (via inflammation) when DHT attaches to the androgen receptor. 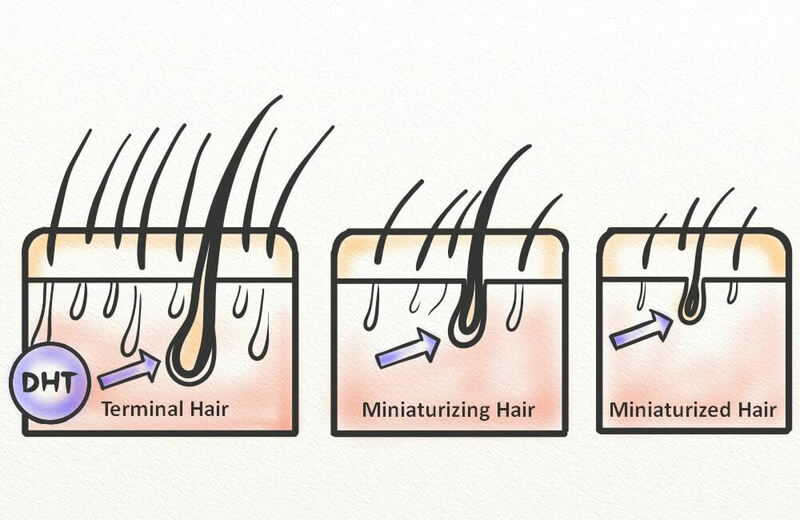 This leads to hair follicle miniaturization and, if left untreated, will lead to thinning of the hair and even baldness (5). Propecia works to reduce this negative reaction by lessening the levels of DHT. 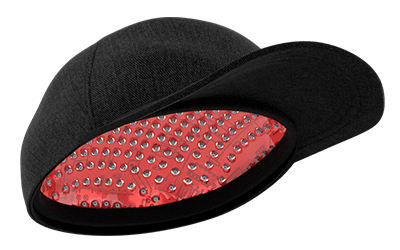 This prevents any further hair loss associated with AGA, and it may even enable hair to regrow. Can Propecia Treat Male-Pattern Baldness? As an FDA-approved treatment for AGA, Propecia has been proven effective in multiple trials and studies. One of the first large-scale trials to study finasteride and its effects on male-pattern hair loss was published in 1999 (6). The study was split into two separate trials, the first consisting of 1,553 men with AGA and the second consisting of 1,215 men who continued from the first trial. The men were given either a 1mg per day dose of finasteride or a placebo pill. Throughout the study, efficacy was evaluated by scalp hair counts, patient and investigator assessments, and the review of photographs by a panel of hair loss experts. At the end of the first one-year trial, there was a significant increase in hair count measured in a 1-inch diameter circular area of balding vertex scalp. The hair count increased from 876 to 973, which is an increase of 12 percent. And while not as significant of an increase at the end of the second one-year trial, the hair counts still did increase from 876 at baseline to 1,014. That’s an increase of 15 percent from baseline to the end of year two. That’s not the only study on the efficacy of finasteride, though. A study published the following year in 1999 showed an increase in both hair counts and weight with finasteride use, and a study from 2000 showed that finasteride increases anagen hair in men with AGA (7, 8). Are There Side Effects Associated With Propecia? As with any drug, there is a risk of adverse effects. The most common side effects associated with Propecia, or generic finasteride, are sexual in nature (9). These may include loss of libido, inability to get or maintain an erection, and poor ejaculatory volume. But consider that the side effects aren’t quite so severe or common as the fear mongering will lead you to believe. In the 1998 study mentioned above, adverse effects related to sexual function were reported at 4.2 percent within the first year in the finasteride-treatment group. Compare this to the similar reports made by 2.2 percent of the placebo group, and it’s easy to see that the risks are quite minimal. Even if one does develop side effects, they aren’t quite so severe to make men quit use of the drug. After all, only 11 men (1.4 percent) in the finasteride treatment group quit the study due to sexual adverse effects. Propecia is not often covered by insurance and, as such, it may cost you anywhere from $70 to $120 per month for a 1mg dose. 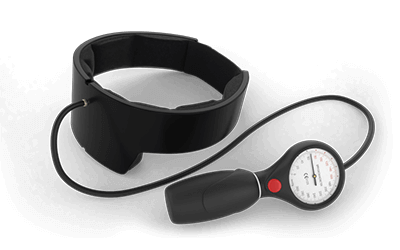 The final cost of Propecia will depend upon your location, as well as your pharmacy, dosage, and whether you have access to coupons or other discounts. You can save money by using manufacturer coupons, or with the use of an app like GoodRx. You might also consider the generic drug, finasteride. How do the costs of Propecia and finasteride compare? As mentioned, the cost of a 30-day supply of 1mg Propecia can range from $70 – $120. This price can be significantly reduced to between $10 and $15 by choosing the generic instead. Propecia versus Finasteride: Is the Cost Worth It? If the monthly cost of Propecia is making you rethink this treatment, you may want to consider the generic finasteride. But how do the two drugs compare? To put it simply, both generic finasteride and brand name Propecia contain the active ingredient finasteride. The only difference between the two drugs lies in their inactive ingredients. Inactive ingredients are those which do not treat the condition, but instead bind the drug together (in this case, in tablet) and ensure delivery once taken. As such, there shouldn’t be any difference between the efficacy of the generic and brand name drugs. This means the cost of the brand name Propecia is not worth it, unless of course you’re allergic to any of the ingredients which are present in the generic. When it comes to combating hair loss, there are a range of treatments with an array of costs. Propecia is one of the lower-cost mainstream options. Best of all, there are ways to save money on Propecia. This includes manufacturer coupons, or even the use of the generic finasteride. To learn more about Propecia, speak with your physician. And if you have any questions on the information above, be sure to leave a comment below.